The CronusMAX PLUS is the third generation in the range that surpasses all of it's predecessors in terms of design and quality, making it more reliable and electronically sound than ever before. The CronusMAX PLUS has been engineered to VALOR standards which are the highest electronic design specifications in the industry. Everything is scrutinized including controlled differential, controlled impedance, differential arrangement of resistors, shunt term thickness and routing of the VCC and GND traces to maximize current flow and minimize signal loss and interference (not to mention there must be separate planes for BOTH GND and VCC - we've seen many faulty PCB layouts where they only have one or two GND planes and no dedicated VCC plane - this is a massive fault in design), placement of the caps on the USB lines, the amount of vias including placement, spacing and thickness, and last but not least critical by-pass caps that should match the data-sheet of each IC. All of these issues have to be considered and are absolutely crucial when designing a PCB. If none of these are taken into account then the design is flawed and will fail any VALOR test. In short, If it passes VALOR, it means it's perfect. CronusMAX (V2) passed every VALOR test. 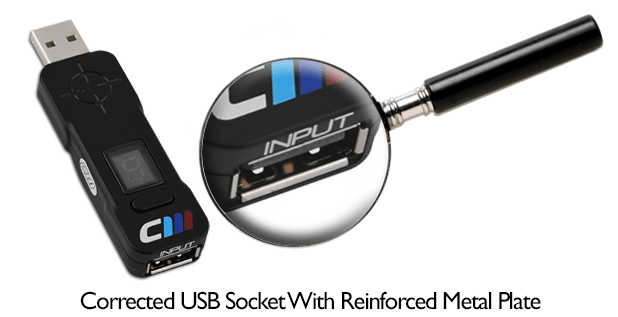 The USB Input socket has also been corrected (previous models had the socket inverted so that your USB devices were being plugged in upside down), and the outer bracket was also reinforced to protect against any accidental damage (think of a child tripping over a wired controller cable whilst connected to the CronusMAX, the design of its predecessors could sometimes cause the socket to break loose giving an E1 error - that issue has now been resolved with a much stronger bond between USB socket and PCB). The plastic shell was completely redesigned using higher quality production molding and techniques so that it was made not only mechanically correct for PS4 operation, but also more aesthetically pleasing and far more durable against everyday wear and tear. device ever created for the video game industry. restricted to using uncomfortable controllers because of the system you are playing on. 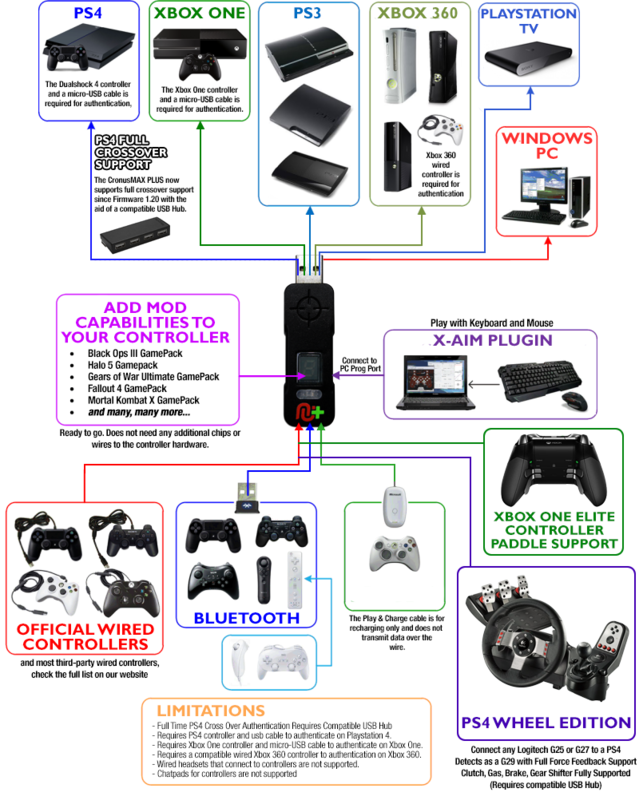 Works with PlayStation 4*, Xbox One**, PlayStation 3, Xbox 360**, Android****, PlayStation TV and PC. New Support Added for PS4 Pro and Xbox One S! Supports most major controllers including Xbox One, Xbox One Elite, PS4, Xbox 360, PS3, Wii and Wii U.
Crossover capability. Ex: Use a PlayStation 4 on your Xbox One, Xbox 360 or PS3.